In general, acute dental trauma is inadequately treated. In some patient populations, less than half of patients who need treatment receive it; of those who do receive treatment, over half receive inadequate treatment. Many patients with acute dental trauma require follow-up with a dentist or an oral surgeon within 24 hours; however, proper intervention should not be delayed. These procedures can improve cosmetic results, prevent tooth loss, and decrease the risk of infection following dental trauma. Dental fractures are divided into categories based on the Ellis classification system. Ellis I: This level of injury includes crown fractures that extend through the enamel only. These teeth are usually nontender and without visible color change but have rough edges. Ellis II: Injuries in this category are fractures that involve the enamel as well as the dentin layer. These teeth are typically tender to the touch and to air exposure. A yellow layer of dentin may be visible on examination. Ellis III: These fractures involve the enamel, dentin, and pulp layers. These teeth are tender (similar to those in the Ellis II category) and have a visible area of pink, red, or even blood at the center of the tooth. Cross section of an Ellis III dental fracture. The pulp of the tooth is very prone to infection. Infection of the pulp is termed pulpitis and can lead to potential tooth loss. The dentin of the tooth is very porous and is an ineffective seal over the pulp. 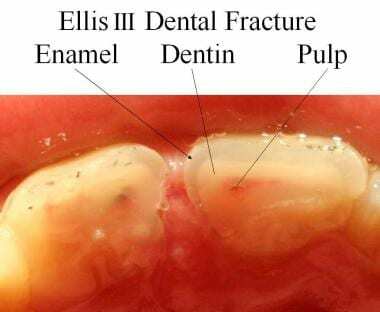 In Ellis II and III fractures in which the dentin or pulp is exposed, the clinician caring for the tooth fracture in the acute setting must create a seal over these injured teeth to protect the pulp from intraoral flora and potential infection. In these situations, the goal is to return the tooth to its correct anatomical position as quickly and securely as possible, without causing further trauma to the tooth, gingiva, or alveolar bone. An estimated 50% of children sustain a dental injury before age 18 years; most children are aged 7-14 years at the time of injury. Permanent teeth injuries make up 90% of the dental injuries to children; the most commonly injured teeth are the central incisors. The tooth anatomy includes the crown, which is the portion of the tooth exposed to the oral cavity, and one or more roots, which are enveloped in bone and the periodontium. Radiographically, the layers are easily identifiable because they have different radiopacities. Enamel is the most mineralized of the calcified tissues of the body, and it is the most radiopaque of the 3 tooth layers. Dentin is less radiopaque than enamel and has a radiopacity similar to that of bone. The pulp tissue is not mineralized and appears radiolucent. For more information about the relevant anatomy, see Tooth Anatomy. In multisystem trauma patients, always address the more critical issues and injuries first. Tooth extraction may be a viable option in some cases of primary tooth injuries. Topical anesthetics should be avoided. Most essential equipment is available in a prepacked dental tray or dental box. The use of calcium hydroxide composition (Dycal). Seat the patient in a reclined position at a 30-60° angle. The patient’s neck should be slightly hyperextended. A dental chair provides ideal support for the desired position. The ability to position the patient may be limited because of the spine precautions necessary in patients with multisystem or isolated head or neck trauma. File down sharp edges, if necessary, with a dental drill or emery board. Dental follow-up, as desired by the patient, is for cosmetic purposes only. Instruct the patient to avoid hot and cold food or drink. Arrange for a follow-up appointment with a dentist within 24 hours. Consider antibiotic coverage with penicillin or clindamycin. Cover the exposed surface with a calcium hydroxide composition (eg, Dycal) or a glass ionomer. Provide immediate dental follow-up and analgesics as needed. Initiate antibiotics with coverage of intraoral flora (eg, penicillin, clindamycin). An avulsed tooth may be gently cleansed in either normal saline or sterile auxiliary solution (eg, Hank's balanced salt solution). Avoid scrubbing the tooth or any unnecessary delay before reimplantation. The tooth can be returned to its original position by applying firm finger pressure. Handle the tooth by the crown, and avoid trauma to the tooth root. Stabilize the tooth with a temporary periodontal splint. This type of injury may not require emergency treatment. Very loose teeth should be pressed back into their sockets. They should then be stabilized with wire or a temporary periodontal splint (eg, Coe-Pak). Patients with dental subluxation should maintain a soft or liquid diet to prevent further tooth motion. These injuries can be left alone and allowed to re-erupt. Pediatric patients (aged < 12 y) have a thinner layer of dentin to protect the pulp. As a result, Ellis II fractures are more likely to become infected and should be treated as Ellis III fractures in this patient population. Update the patient’s tetanus vaccination, if necessary. Instruct patients to eat only soft foods following all injuries (except an Ellis I fracture). Always consider the possibility of abuse (eg, child, spousal, or elder abuse) when patients present with dental fractures. Complete a physical examination of the bony structures of the face when indicated to ensure that a more serious injury (eg, Le Fort fracture) is not missed. Examine all intraoral lacerations for tooth fragments, which can result in chronic infections. For information on the treatment of intraoral lacerations, see Medscape Reference articles Complex Lip Laceration and Complex Tongue Laceration. Avoid topical anesthesia, as it can increase the risk of a sterile abscess and irritation. Dental blocks are very useful for pain control. If teeth or partial teeth are missing, obtain a radiograph of the chest to rule out pulmonary aspiration  or a CT scan of the face to rule out intrusion into alveolar bone or gingiva. All dental fractures (except for Ellis I) require dental follow-up within 24 hours. Needleman HL, Stucenski K, Forbes PW, Chen Q, Stack AM. Massachusetts emergency departments' resources and physicians' knowledge of management of traumatic dental injuries. Dent Traumatol. 2013 Aug. 29(4):272-9. [Medline]. [Full Text]. Gabris K, Tarjan I, Rozsa N. Dental trauma in children presenting for treatment at the Department of Dentistry for Children and Orthodontics, Budapest, 1985-1999. Dent Traumatol. 2001 Jun. 17(3):103-8. [Medline]. Bruns T, Perinpanayagam H. Dental Trauma that require fixation in a children's hospital. Dental Traumatol. Dec / 2007. 24:59-64. Nalliah RP, Rampa S, Lee MK, Allareddy V, Allareddy V. Epidemiology and Outcomes of Hospital-based Emergency Department Visits with Tooth Fractures. Pediatr Dent. 2015 Jul-Aug. 37 (4):348-54. [Medline]. Diangelis AJ, Andreasen JO, Ebeleseder KA, et al. International Association of Dental Traumatology guidelines for the management of traumatic dental injuries: 1. Fractures and luxations of permanent teeth. Dent Traumatol. 2012 Feb. 28(1):2-12. [Medline]. Madan K, Aggarwal AN, Bhagat H, Singh N. Acute respiratory failure following traumatic tooth aspiration. BMJ Case Rep. 2013 Feb 6. 2013:[Medline]. Hile LM, Linklater DR. Use of 2-octyl cyanoacrylate for the repair of a fractured molar tooth. Ann Emerg Med. 2006 May. 47(5):424-6. [Medline]. Wiand D, DiNapoli D, Burkhartsmeyer A, et al. Tissue Adhesive, 2-Octyl Cyanoacrylate, is an Effective Emergency Department Treatment for Pain Associated with Dental Caries. Annals of Emergency Medicine. September, 2007. 50:S36. Auerbach PS, ed. Trauma to the face and jaw. Wilderness Medicine. 4th ed. St Louis, Mo: Mosby; 2001. Buttaravoli P, Stair T, eds. Dental trauma (fracture, subluxation and displacement). Minor Emergencies: Splinters to Fractures. St Louis, Mo: Mosby; 2000. Flores MT, Andreasen JO, Bakland LK, et al. Guidelines for the evaluation and management of traumatic dental injuries. Dent Traumatol. 2001 Jun. 17(3):97-102. [Medline]. Hamilton FA, Hill FJ, Holloway PJ. An investigation of dento-alveolar trauma and its treatment in an adolescent population. Part 1: The prevalence and incidence of injuries and the extent and adequacy of treatment received. Br Dent J. 1997 Feb 8. 182(3):91-5. [Medline]. Roberts JR, Hedges RJ, eds. Dentoalveolar trauma. Clinical Procedures in Emergency Medicine. 4th ed. Philadelphia, Pa: WB Saunders; 2004. 1320-30. Rosen P, Barkin R, eds. Dental emergencies. Rosen's Emergency Medicine Concepts and Clinical Practice. 3rd ed. St Louis, Mo: Mosby; 1992. Wilson S, Smith GA, Preisch J, et al. Epidemiology of dental trauma treated in an urban pediatric emergency department. Pediatr Emerg Care. 1997 Feb. 13(1):12-5. [Medline]. The authors and editors of Medscape Reference gratefully acknowledge the contributions of previous author Melissa Moore to the development and writing of this article.